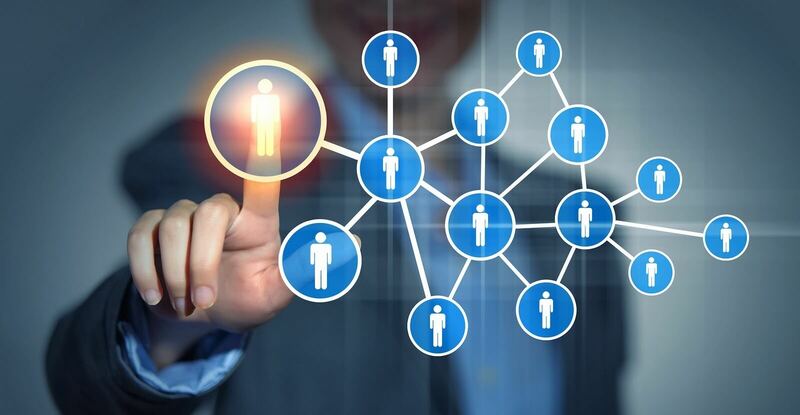 Here’s the LATEST list of the Top 100 MLM Network Marketing Companies in the world, as per DirectSellingNews.com. Click through the links to know more about the company history and progress over the years. Struggling In Network Marketing? CLICK HERE!Here's Why Most Struggling Reps Are Choosing A Smarter Method To Prospect New Customers & Make More Sales Leveraging The Internet! 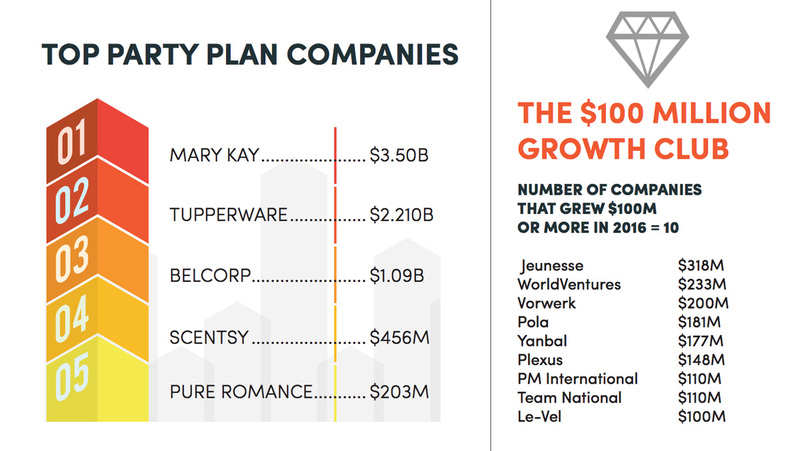 Amway is an $8.8 billion direct selling business based in Ada, Michigan. Top-selling brands for Amway are Nutrilite vitamin, mineral and dietary supplements, Artistry skincare and color cosmetics, eSpring water treatment systems, and XS energy drinks. Herbalife is a global company that sells products intended to support a healthy lifestyle. Its products are formulated according to nutrition research and science and are manufactured to the highest standards of safety and quality. Herbalife products are available exclusively through independent Members. The Vorwerk & Co. KG family enterprise was founded in 1883. Vorwerk’s core business is the global direct sales of high-quality household products such as the Kobold vacuum cleaner, Thermomix kitchen appliance, Twercs tools, Lux Asia Pacific products, as well as JAFRA cosmetics. Natura is a multinational direct seller of cosmetics, personal care and beauty products and the leading direct seller in Brazil. In 2014, the company became the first listed corporation to be certified by B Corp, which recognizes companies that give equal value to their economic, social and environmental results. Nu Skin Enterprises Inc. offers a comprehensive line of premium beauty and wellness solutions. The company builds upon its scientific expertise to develop innovative product brands that include Nu Skin®, Pharmanex®, and ageLOC®. Primerica assists clients in meeting their needs for term life insurance, which it underwrites, as well as mutual funds, annuities and other financial products, which it distributes primarily on behalf of third parties. In 2016, Primerica insured more than 4 million lives and maintained approximately 2 million investment accounts on behalf of clients. 13. JoyMain Science and Technology Development Co. Ltd.
JoyMain adheres to a “law-abiding, honest, caring, quality” business philosophy in providing high-quality health and personal care products and business opportunities. The company researches, manufactures and sells a variety of products with a focus on high-tech health care products. Jeunesse is a global youth enhancement company with a mission to impact the world by helping people look and feel young, while empowering them to unleash their potential. Jeunesse utilizes multilingual customer service, back office support and a global enrollment system. Oriflame sells a wide portfolio of Swedish, nature-inspired, innovative beauty products. Respect for people and nature undlerlies Oriflame’s operating principles and is reflected in its social and environmental policies. The company supports numerous charities worldwide and is a co-founder of the World Childhood Foundation. Ambit Energy provides electricity and natural gas services in deregulated markets across the United States, primarily marketed through the direct sales channel. *An earlier version of the 2017 Global 100 list contained an incorrect revenue figure for Ambit Energy. The company has certified that its net sales were $1.20 billion, ranking it No. 16 on the Global100. 16. New Era Health Industry Group Co. Ltd.
Based in China, New Era is dedicated to the research and development of health foods, nutrition, cosmetics and chemical commodities. The company partners with many research institutions at home and abroad. Telecom Plus, which owns and operates the Utility Warehouse brand, is the UK’s only fully integrated provider of a wide range of competitively priced utility services spanning both the Communications and Energy markets. Members benefit from the convenience of a single monthly statement, consistently good value across all their utilities and exceptional levels of service. 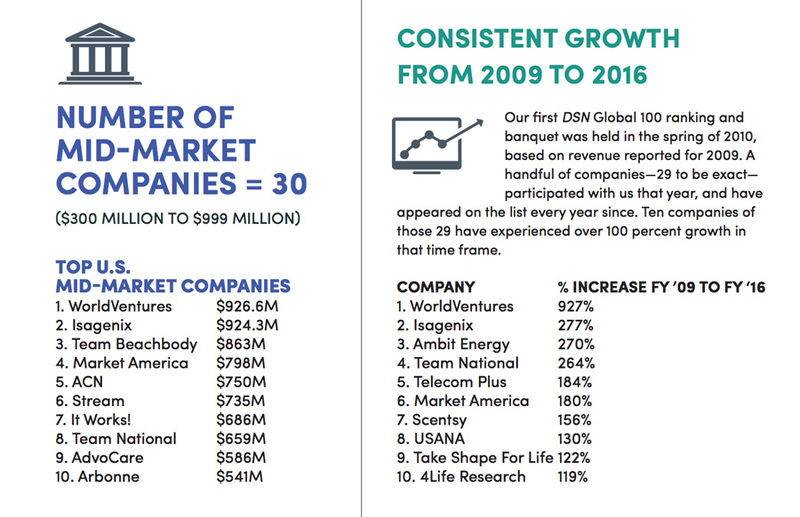 USANA Health Sciences is one of the top health and wellness companies in the world. Founded in 1992, USANA has become a global company that is highly regarded for not only the quality of its products but the exceptional work of its employees. USANA’s products consist of supplements, vitamins, foods and a skincare line all manufactured to meet the highest of standards. Founded by Shinobu Suzuki, Pola has earned a global reputation for its high-quality skincare, hair-care and cosmetics products as well as its commitment to supporting women in their pursuit of more satisfying lifestyles. Young Living Essential Oils is the world leader in essential oils with a strict Seed to Seal®process to produce pure essential oil products for every individual, family and lifestyle. This process ensures that all products are genuine, free of synthetic chemicals and pure. This commitment stems from the company’s 20 years of stewardship of the earth. Founded by Chen Shangji and Zheng Zhuyu, Sun Hope is devoted to “spreading beauty and health” through preventative medicine. The company’s four main product lines are SUN HOPE healthy care products; SUN HOPE skincare products; SUN HOPE household products; and SUN HOPE personal cleaning products. The core business activities of DXN include cultivation, manufacturing and marketing of health food supplements. Product lines include dietary supplements, food and beverages, personal care products and water treatment systems. WorldVentures is the leading international direct seller of vacation club memberships and helps people achieve more fun, freedom and fulfillment by offering award-winning DreamTrips™, which include premium vacations at reduced prices. Isagenix develops and manufactures nutritional and personal care products and solutions that include health and wellness, weight loss, performance, healthy aging, and energy. Market America is a product brokerage and Internet marketing company that specializes in one-to-one marketing. Its mission is to provide a robust business system for entrepreneurs, while providing consumers with an alternative way to shop for everyday products. Stream is a leading direct selling company and provider of connected life services. The company’s innovative use of direct selling revolutionized the energy industry, generating more than $8 billion in total revenue in 12 years. Stream Connected Services work seamlessly together to fit customers’ on-the-go lifestyles, keeping them connected wherever they are. Tiens engages in the research, development, manufacturing and marketing of healthcare products including herbal products, vitamin and mineral supplements and personal care. The company has produced 45 types of healthcare products, which have obtained the “Health Food Certificates” issued by the PRC Ministry of Health. Yandi is a nutritional and cleaning products company operating in eight provinces in China. Operating in Japan, Taiwan and Malaysia, Miki Corp. markets nutritional products, skincare and a range of household detergents. Family-owned AdvoCare offers premier nutritional, weight-management and sports-performance products backed by scientific research and a Scientific and Medical Advisory Board. 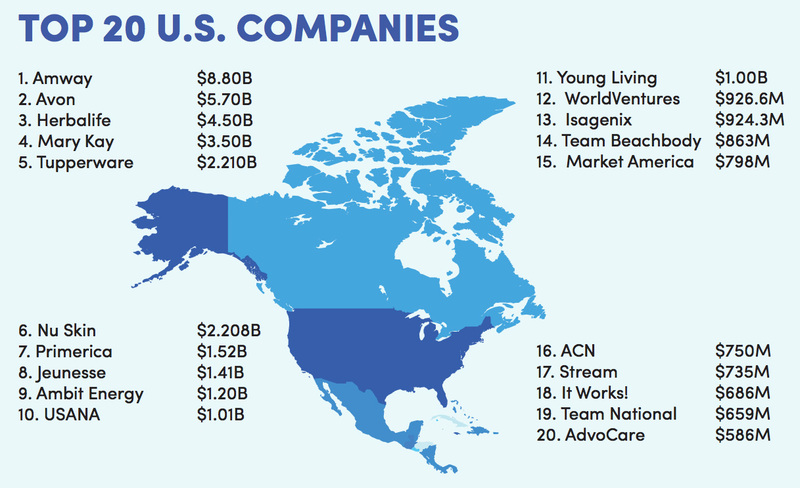 In addition, AdvoCare empowers Independent Distributors with an industry-leading business opportunity and world-class training and business tools. Arbonne International creates personal care and wellness products crafted with premium botanical ingredients and innovative scientific discovery. Arbonne’s personal care and nutrition formulas are vegan certified, cruelty-free, formulated without gluten, dermatologist tested and adhere to a strict Ingredient Policy. 40. Rolmex Technology Co. Ltd.
PM-International is one of Europe’s largest direct selling companies in the areas of Health, Wellness and Beauty. It offers premium nutritional supplements and skincare with its FitLine and BeautyLine series. Scentsy is a direct selling company and international leader in home and personal fragrance, offering styish, innovative and customizable product designed to Warm the Heart, Enliven the Senses and Inspire the Soul. LegalShield is the leading provider of legal services in all 50 states and four Canadian Provinces.The company’s goal is to create a world where everyone can access affordable, responsive and accountable legal services, offering peace of mind. LegalShield is also one of the largest providers of identity theft protection and restoration. Le-Vel is the first cloud-based direct selling company. The company offers a premium grade nutritional supplement product line, THRIVE, which utilizes cutting-edge proprietary formulas and delivery systems. Omnilife provides nutritional supplements with a unique blend of ingredients vital to a healthy life. Committed to improving the lives of people around the world, the company specializes in developing and manufacturing innovative nutritional, personal care and cosmetic products that are sold through independent distributors. Faberlic is Russia’s largest direct seller with its own production facilities and R&D. The company offers a wide range of products from cosmetics to home care, apparel and accessories. 50. Nature’s Sunshine Products Inc.
Nature’s Sunshine Products is a leading natural health and wellness company that markets and distributes nutritional and personal care products. The company manufactures most of its products through its own state-of-the-art facilities to ensure the highest quality, safety and efficacy in its products. The company also supports health and wellness for children around the world through its partnership with the Sunshine Heroes Foundation. This is the rank in the year 2010! It’s outdated! Beautiful work…..I loved the write up.